Novibet Casino launched in 2010 and is currently one of only two sites within the Novigroup Limited roster. In many ways, you can tell because they have put a lot of effort into making this very good with some excellent features. In this Novibet Casino review, we’ll take you through all of those good points – plus a few negatives – for the full picture. Good welcome bonus – but high wagering. There’s also a special £500 loyalty program reserved for new players only. After you amass a certain number of points by playing slots and games, you’ll be given a cash boost! N/A – No bonus code is needed to activate the welcome bonus. All players have to do is opt-in for the promotion and make the minimum deposit required. 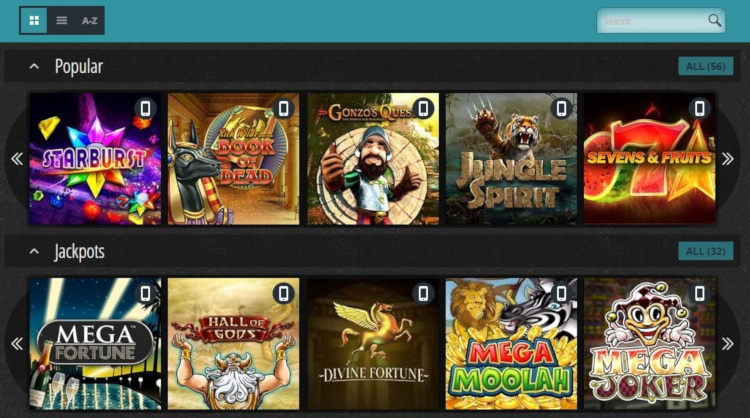 Unfortunately, there are no free spins available from Novibet Casino’s welcome bonus. However, they run regular promotions (see below) where you can get a few once you’ve joined. It is always important to take note of the terms and conditions that come with any promotion. The wagering requirements are x35 the bonus and deposit (effectively x70). If you request to withdraw before the wagering requirements have been met, then the bonus amount and any winnings derived from it will be forfeited. Okay, so the wagering requirements are very high – but at least it’s forfeitable. This means you use your real money first, and if you win then you can give up your bonus without the need to wager anything. Alternatively, if you lose, you’re given a second bite of the cherry. Once that’s all done, there are a lot of promotions to take advantage of. Of course, these are subject to change, but here’s what the Professor found while conducting his Novibet Casino review. When you play at Novibet Casino, you’ll be part of a VIP scheme that will allow you to get a monthly cash bonus (similar to the new player £500 programme). Simply play games to earn points – and if you manage to get over 15,000 then a cash injection will be provided. Another great aspect is that casino bonuses are given literally every single day at Novibet. Usually, it’s free spins on the table, but other offers such as special live casino bonuses and cashback are known as well. Novibet Casino have a lot of deposit/withdrawal options to cater to you. Currently, you can use the following payment methods: Bank Wire Transfer, Maestro, MasterCard, Neteller, Paysafe Card, Visa, and Skrill. Rather specially, they also happen to be a casino that accepts PayPal too! The withdrawal time at Novibet Casino varies depending upon the method you use. If you’re accessing their UK casino, the usual KYC identity verification checks will need to be satisfied to begin with. Then, all withdrawal requests need to be approved – which they aim to complete as quickly as possible. There is an absolutely massive games library at Novibet – with the Professor estimating around 1,500. This is a whopping figure, and it’s only increasing with new releases most weeks. The types of game on offer are things like slots, live tables, classic games, themed-slots, poker and other card games, plus jackpots. All these are provided by some of the biggest developers around – such as NetEnt, Play’n GO and Microgaming. 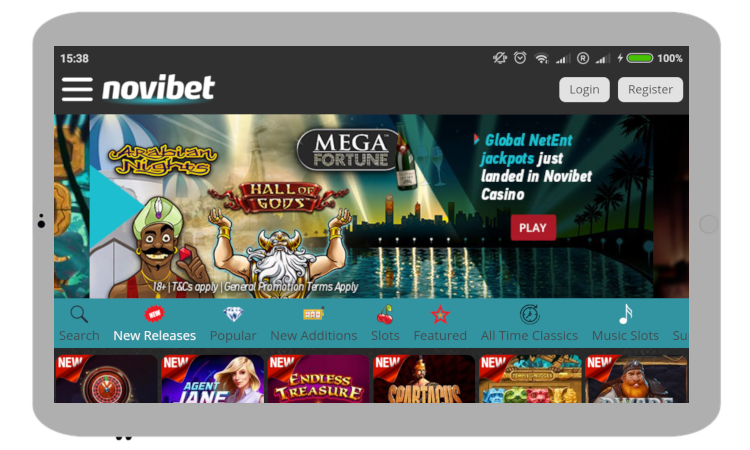 Novibet are really on the ball when it comes to mobile casino. They have fully optimised their site for smartphones and tablets so that it will perform well on all devices. In addition to this, they indicate all of their mobile games (with a little mobile logo) so you can pick out what you want. 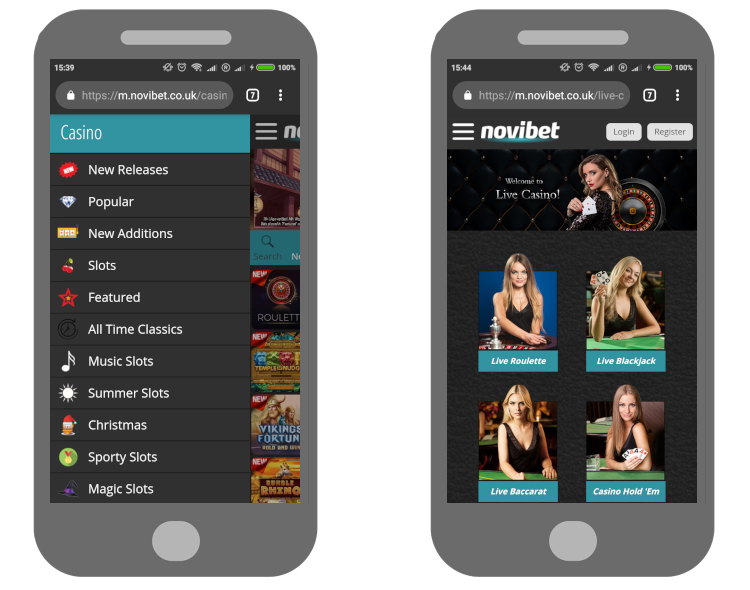 There have been rumblings of a Novibet app over their many years, but nothing has been developed thus far. Still, the Novibet mobile casino site is well-equipped so you can save your storage space. Safety and security have to be a top priority, and the Professor was pleased with what he saw in his Novibet Casino review. They deploy 256-bit SSL encryption for transactions, certified by GoDaddy. To operate, they currently have two different licences: one comes from the UK Gambling Commission (UKGC) and another from the Greek Gaming Commission. These are both highly regarded and reputable sources for licences, which means players can be safe in the knowledge that they’re afforded many legal protections when playing at Novibet. They have a clean bill of health from Britain too, with no recorded sanctions or negative comments on their UKGC license. Okay, while we highly doubt many players utilise fax these days, the fact that Novibet have a Skype account is very pleasing. We know some prefer to speak to people directly, but phone numbers are often reserved for one country only – so you can rack up a sizeable bill. Not here – just log in to your Skype account and call across the internet for free! No gambling site can operate entirely worldwide, but Novibet give it a good go. However, here’s the list of countries which are not eligible: Australia, France, Germany, Sweden, Turkey, and the United States. I’ve been so impressed by Novibet, I’d highly recommend them to anyone looking for a new casino to play at. They have tonnes of games, which is what I always like to see, and they round that off with tonnes of promotions too. The high wagering is annoying, but if you manage to win on your first few spins then you can easily forfeit and pocket the cash. Go and give them a try – and report back with your own Novibet Casino review.